We are building new aircraft carriers. 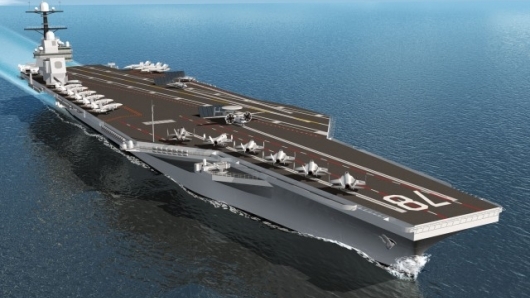 Navy expects to build about 11 of them....the last one not finished until 2058. A 2009 report said that the Ford would cost $14 billion including research and development, and the actual cost of the carrier itself would be $9 billion. Of course... that is what the cost is estimated at NOW. Gosh, just another case of building social programs that help the middle class. Funny how the government can always find money for military hardware, but is hard-pressed to find funds for social services, education, and the environment. But he likes nachos. And some beer. I'll have you know that Romney has plans to outsource them to Carnival Cruise lines. Just think of the possibilities, we can bomb people back into the stone age and play shuffleboard and enjoy the midnight buffet all for one low price. Perfect for a country perpetually at war. After all, war is all we do now. Oh well, if the Greenland ice sheet goes the population of NYC will at least have somewhere to live. MittWitt and his rich, race team owner friends will rake in many of those billions as their companies build those ships, all the while ripping off the actual women and men doing the work. Unfettered capitalism. What a crime. Susan...great idea... and Donald Trump can build a casino on it!! Are these guys nuts? Do they not recall how accident prone Gerald Ford was? Is naming this vessel after him inviting a disaster? Wouldn't want to be on this nuclear powered ship when it hits an unchartered island.